Use this silent counter to remind yourself in those less demanding moments to focus your mind on the spiritual love of your life. By having the counter on your finger while walking, driving, or relaxing, it will effortlessly remind you to do your positive affirmation, mantra or prayer. Amazing results will flow into your mind by the sincere feeling expressed by continually affirming your mantra or prayer. Religionists often enthuse over a particular belief system; whereas true spiritual adherents understand that spiritual evolution with its natural joyous consciousness expansion comes by repetitive spiritual thoughts and actions. 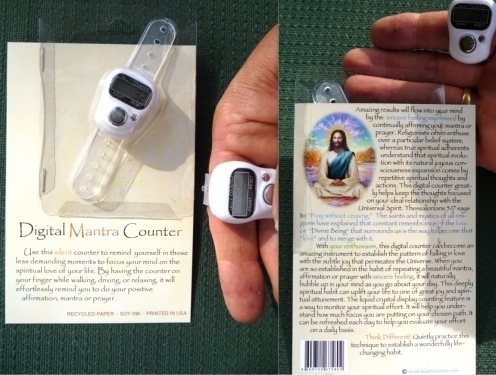 This digital counter greatly helps keep the thoughts focused on your ideal relationship with the Universal Spirit. I Thessalonians 5:17 says to “Pray without ceasing.” The saints and mystics of all religions have explained that constant remembrance of the love or “Divine Being” that surrounds us is the way to become that “love” and to merge with it. With your enthusiasm, this digital counter can become an amazing instrument to establish the pattern of falling in love with the subtle joy that permeates the Universe. When you are so established in the habit of repeating a beautiful mantra, affirmation or prayer with sincere feeling, it will naturally bubble up in your mind as you go about your day. This deeply spiritual habit can uplift your life to one of great joy and spiritual attunement. The liquid crystal display counting feature is a way to monitor your spiritual effort. It will help you understand how much focus you are putting on your chosen path. It can be refreshed each day to help you evaluate your effort on a daily basis. Think Differently! Quietly practice this technique to establish a wonderfully life-changing habit. There are many excellent websites that go into detail on positive affirmations to attract wealth and security. Dive deeper into the subject if you are not sure you are doing your affirmations with the correct degree of positive determination. Includes barcode on packaging for easy pricing and inventory control.